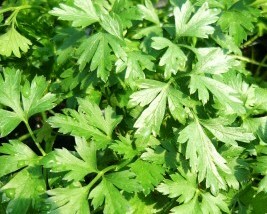 Italian Flat Leaf Parsley - Large Flat green leaves on tall stems. Strong parsley scent and flavor, most commonly used variety for cooking. Biennial zones 6-9 Live plant in 3 inch container.